If there is any preseason game where legitimate conclusions can be made about a team, it is the third one. That’s when teams tend to play their starters longer; it’s like a dress rehearsal for the season opener. So, if the Browns wanted to see where they are, playing the defending Super Bowl champs in the third preseason game was just what they needed. 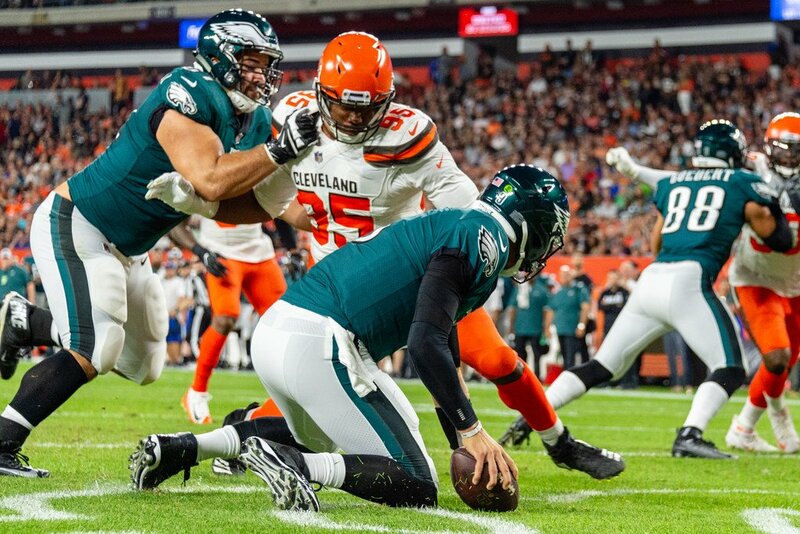 From what we saw Thursday night, it appears as if the Browns offense may need some work, the defense is going to surprise people this season, and the Eagles better hope Carson Wentz gets better soon. It wasn’t a good game for quarterbacks— or the offense side of the ball for either team. Well—there were some decent performances by a couple running backs. So, it was either a bad day for offense or a fantastic one for defense. The Eagles will certainly not be trading Nick Foles No one is going to want him. After the Super Bowl, his value was sky high. But after a lackluster outing last week and this week’s disastrous on, they’d be lucky to get a conditional sixth-round pick. His final passing numbers were not terrible, 13-17 for 127 yards. But the two interceptions, one fumble, a safety, and a turnover on downs—that is terrible. He looked more like the guy the Rams couldn’t get rid of fast enough in 2015 and not the one that just won the Super Bowl. Wendall Smallwood (12 carries for 53 yards) had a good night carrying the ball as did undrafted free agent rookie Josh Adams (four carries for 33 yards). The Browns made a very questionable decision by letting Tyrod Taylor (11-16 for 65 yards) go back in the game after apparently injuring his hand in the first quarter. They’ve been clear about their intentions to start him this season. They should have protected him. It’s not like he was having a great day anyway. If he was thinking he needed to secure his job and lead the team, that’s great. But it was ultimately unnecessary. Baker Mayfield didn’t exactly do anything to take the job away from him. His numbers were not terrible (8-12 for 76 yards and an interception). But they don’t say ‘start me’ either. Cleveland could have a pretty good running game this year. Carlos Hyde had an alright night (seven carries for 45 yards; had one carry for 33 yards). Nick Chubb (14 carries for 46 yards; long of 21) appears to be one of those guys who could get bottled up easily if there’s nowhere to run. But when he finds a gap, he, going to make the most of it. The Cleveland defense looked pretty darn good with sevens sacks, four turnovers, and a safety. They made sure Foles was not going to have a chance to find his rhythm. The Brown s defense didn’t give Nate Sudfeld (11-21 for 72 yards), a chance to do so either. They had the added benefit of not having to face many starters. But they still looked good. For those who keep score in the preseason, the Browns won, 5-0. Philadelphia will close out the preseason next week against the New York Jets. Cleveland will close out their preseason with a trip to Detroit to take on the Lions.